"It's important for kids to know there's always somebody in the world who cares." Jeremy and Tamara Cohn, 10, sign cards for "The Friend Send." Any parent who has a child who's been bullied, left out, or *wipes a tear* had no one show up for their birthday party knows the anguish and heartbreak of watching their little one suffer from the cruelty of others. No child should ever have to feel that way. That's why Vaughan, Ont. 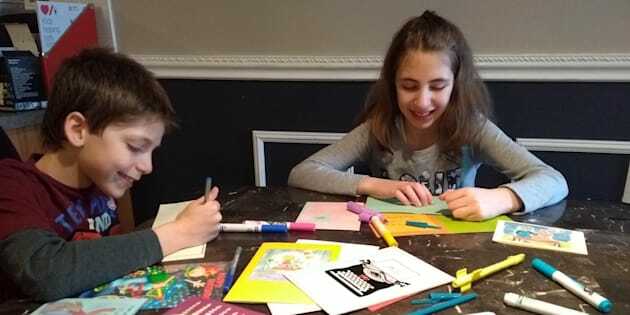 mom Jessica Cohn started "The Friend Send," a project that sends cards to children 12 and under who are feeling alone on their birthdays, being bullied, or going through a hard time. "I'd been seeing a lot of posts in Facebook groups about kids having birthday parties and having no one show up, and it made me really sad," Cohn told HuffPost Canada in a phone interview. "I couldn't imagine that happening to my own kids. Just the thought of a kid being that miserable made me so upset. So I talked to my kids, and we decided to do something about it." Jessica Cohn and her children Tamara and Jeremy (both 10). Cohn, along with her children, 10-year-old twins Tamara and Jeremy, write handwritten notes of encouragement in each card they send out. They've already sent out 83 cards all across Canada since they launched in October, and the requests for cards have been pouring in. Cohn received 60 requests Wednesday alone, she said. The project, which started by focusing on birthday cards, has now expanded to include what Cohn calls "kindness cards" for kids who are being bullied or going through a rough time. "We just want these kids to know that we think they're awesome," Cohn said. Messages from the twins include notes of encouragement such as, "I hope you have the best birthday ever," "I'm sending you a birthday hug," "We're cheering for you," "I believe in you," plus a hand-drawn picture, Tamara Cohn told HuffPost Canada. "I think it means so much to them if they hear from other kids that we're there for them," Tamara said. As more requests for cards pour in, Cohn has been fundraising for a P.O. box (and stamps) so that other interested people in her Facebook community can help send cards to kids, all while keeping their addresses confidential. Some of the situations the children who receive cards are in are quite difficult and heartbreaking, Cohn said. And it can mean a lot to receive a message of support from someone other than their own parents, who they might believe are only saying nice things because, well, they're their parents. "More than anything, I think's it's important for kids to know there's always somebody in the world who cares," Cohn said. "There's always a source of support out there. Even if things are rough at school, even if things are rough at home, there's always someone out there who believes in them."